Customer satisfaction is our priority, so we currently offer two different promotions depending on what you're looking for. Whether you need a technician to come and repair your lock or you need new nightlatch installation these special offers will be perfect for you. 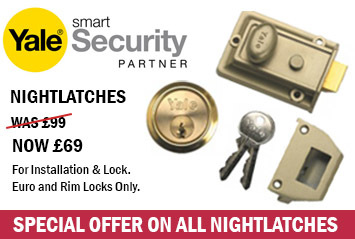 Special offer on ALL nightlatches! Save up to £30 for lock installation & lock included! Nightlatches come in all shapes and sizes and with various levels of security. With our professional locksmiths you can save up to £30 for the lock and installation package. We are currently offering the installation with the lock included for just £69! (usually £99). This is for all Euro and Rim locks only.